To celebrate the official kickoff of bicycle season in Colorado, Bicycle Colorado held its Gala 2016 fundraiser Friday night. The group uses money it raises partly for education and advocacy to make Colorado one of the safest and most bicycle-friendly states in the United States. 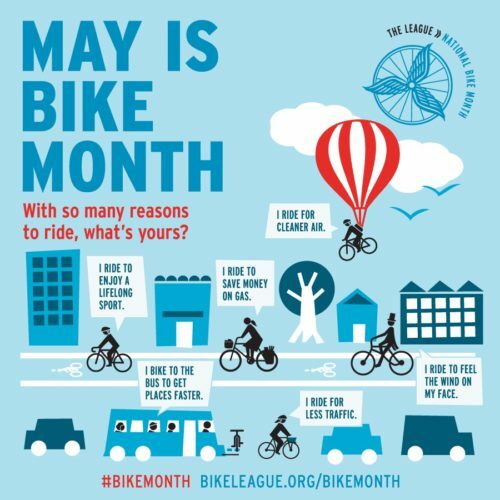 The start of bicycle season in Colorado coincides with the May 1 start of National Bike Month, which is sponsored by the League of American Bicyclists. Among the top 10, Portland, Oregon, No. 3, had the highest percentage of bike commuters. Its 23,347 commuters made up 7.2% of its 2014 population of 619,445. In addition to Denver, one other Colorado city appears on the 2014 list, Fort Collins, with 5,075 riders, or 6.2% of its 156,473 population in 2014, commuting by bike. The report lists Boulder and Fort Collins, Colorado, as Nos. 3 and 8, respectively, on its list of the 20 cities with the highest share of bicyclists. Boulder had 8.9% of its 2014 population of 105,101 commuting by bike; and Fort Collins had 6.2% of its 156,473 2014 population as bike commuters. A Is for Air: Make sure a bike’s tires are inflated to the correct pressure, which is listed on the side of the tire. The League suggests you use a pressure gauge to make sure the tires are inflated to the right pressure. Also, be sure to inspect your tires for damage, and get new ones if necessary. B Is for Brakes: Check your brake pads for wear. They need to be replaced if there is less than a quarter-inch left of the brake pads. Make sure the pads are in place. They should not be rubbing against the tire. And make sure you can place your thumb “between the brake lever handlebar” when you have squeezed the brakes as far as possible. Quick Is for Quick Releases: Make sure they’re all closed. To make sure they don’t get caught on anything, see that they are all pointing to the bike’s rear. Check Is for Check It Over: Finally, check that all is working by taking a quick ride. In addition, a bicyclist should wear a well-fitting helmet, tight-fitting clothes, and bike shorts and layers in cold weather, along with gloves and ear warmers. For safety, especially in rain and at night, wear bright colors and reflective gear, and in rainy weather, also wear waterproof clothing.